Apparel brands and retailers often struggle with inconsistent garment quality—and don’t know why. You might place the exact same order from your garment supplier as you did the month before, only to notice a sudden decline in fabric quality. Or perhaps you’ve made a seemingly logical, cost-cutting move—like sourcing “Pima” yarn from a different spinner to save 20 cents per garment—only to see an uptick in consumer complaints. The answer often lies at the earliest parts of your supply chain: the raw material and yarn spinning. When brands fail to ask the right questions about their sourcing, their sales and standing suffer for it. When you’re only concerned with the final stages of a supply chain, small sourcing decisions can seem inconsequential—you might not even be aware of them. Chances are, you’ve seen the effects of less-than-stellar sourcing: your fabric seems fuzzier and more prone to pilling, it feels boardie to the touch, the colors fade faster, garments skew out of place and may tear more easily. No doubt, your customers have noticed, too. In a buying environment where consumers do more research, make more discerning choices, and are prone to write scathing reviews, your brand can’t afford to under-deliver. Here are the questions you need to ask your suppliers to prevent poor quality. The very first step of manufacturing your apparel—the choice of raw material—may be the most important. Your material selection, whether organic, synthetic, or a blend, will dictate what your finished product can achieve—and what kind of performance you should expect. Different fibers have different properties that affect the quality of your apparel: strength, length, and micronaire (fineness) are the three most important properties, and they’re all interrelated. Finer, stronger fibers also require fewer twists when spinning; while more twists increase a fabric’s strength, they also make it less soft and more likely to torque or skew out of place—particularly in knit fabrics. If the final product doesn’t live up what you would expect from that fiber, that’s a red flag that you have a weak link in your supply chain. If you or your supplier isn’t aware of the material selection, these under-the-radar choices can negatively impact your brand. •	What’s the original source of this fiber—what location does it come from, and what company produced it? •	What is your relationship with the fiber producer? •	What kind of performance should I expect from this fiber? •	Will the costs of this fiber fluctuate, and how will that affect my garment costs and quality? 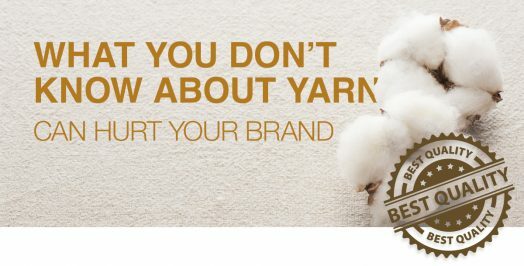 Your brand should know the yarn spinners you’re using—and you should be equipped to make informed decisions that go beyond price. You’ve got to weigh and balance several variables; relying strictly on price is bound to yield an inferior final product. Compromising on quality can also lead to unforeseen manufacturing problems that require inefficient, costly fixes. In particular, you should be aware of the spinning mechanism used to create your yarn. Make sure your suppliers are choosing the spinning system that aligns with how you want your fabric to behave: whether you care about the drape, luster, longevity, softness, torque, or price, you should know how the spinning system impacts these qualities. See the table below for a basic sense of how spinning systems affect different garment qualities. •	What company spun this yarn and where are they located? •	What spinning process was used to create this yarn? •	What other spinning systems can the producer use, and how will they affect the cost and quality of my garment? Once you have a better understanding of your fiber and yarn, you can determine whether the garments live up to expectations or fall short. If your apparel is underperforming, it’s time to talk to your entire supply chain and find a solution. You know there’s a weak link, but that doesn’t mean you should start lopping off heads and burning bridges. Your supply chain deserves a chance to solve the problem together—after all, everyone has the same ultimate goal: selling this garment. Gather everyone on a conference call and get to the bottom it. What changed? You may find that someone changed suppliers, switched spinning methods, or started cutting corners without your notice. Working together, your partners can brainstorm solutions to improve the quality without dramatically increasing costs. To prevent problems like this from occurring again, your brand needs to act as an educated buyer and ask the right questions. Whether it’s a third-party consultant or a new hire to your team, make sure you have someone on hand with garment expertise—not just generic “business acumen.” When brands get MBAs with no textile know-how to call all the shots, you develop a tunnel vision towards price and end up asking the impossible. If you’re demanding high quality at an impossibly low price, you’re sure to find a supplier offering the right price and false promises. Once you know what it takes to get the quality your customers expect, you won’t get fooled by too-good-to-be-true promises on price. Ultimately, your brand has to choose how you control costs and quality when sourcing. Do you make quick, uncritical choices that risk declines in customer loyalty down the road? Or can you invest in the legwork needed to make smart, informed decisions that ensure long-term success? When you’ve asked the right questions, the answer falls seamlessly into place. To learn more about the nuances of yarn and supply chain influences, contact David Sasso.